If you are lucky, then you may have already been introduced to Girl Scout Cookies. These delicious treats have been a mainstay in the U.S. for almost 100 years, thanks to the Girl Scouts of the United States of America (GSUSA), a major youth organization for girls that was created in 1912 to empower young girls and teach them core values such as honesty and compassion. The Girl Scout Organization is represented in communities across the United States, as local chapters lead girls in their community on activities ranging from camping to community service. As part of an effort to fund these activities, the Girl Scouts began selling cookies to raise money. The earliest record of Girl Scout Cookies dates back to 1917, when the girl scouts would bake the cookies with supervision from their mothers in their own ovens. Back then, the cookies were home made and followed a simple sugar cookie recipe. In the 1930s, as the cookies were becoming widely popular, the Girl Scouts began licensing their popular cookies to commercial bakers to produce on a larger scale. In the 1950s the Girl Scouts began introducing different flavors including chocolate mint (now known as Thin Mint), shortbread (Shortbreads) and peanut butter sandwich cookies (Do-si-dos)--flavors that are still popular today! Today there are 28 different variations of Girl Scout cookies, though some flavors are only offered regionally. Girl Scouts earn prizes for selling cookies, and there are even group incentives if the unit as a whole does well in sales. Girl Scouts set up booths in public spaces to sell the cookies during cookie season (determined by each community), and also sell to their friends, neighbors, parents, coworkers and extended family. You can only purchase the cookies during cookie season, as they are not available year round and not available online. You will know it's Girl Scout cookie season if you see the colorful boxes floating around your office. Modern Girl Scout cookie boxes are brightly colored and display images of Girl Scouts being active and growing stronger. Girl Scouts also team up with local charity organizations such as one based out of the state of Georgia, called Hugs for Soldiers, that send care packages containing Girl Scout cookies to soldiers deployed overseas. Girl Scout cookies are a classic American treat and to send them to soldiers abroad is to offer them a little taste of home. If you get a chance, be sure to get a taste of this American tradition. In 2012, Girl Scouts will celebrate their 100th anniversary. In honor of that achievement, the organization has also decided to give Girl Scout cookies a makeover! 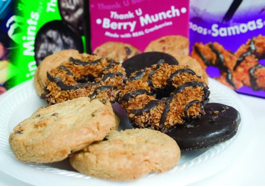 New boxes that highlight Girl Scouts' skills and deeds will be released in the 2012 cookie season as part of the "This is What We Can Do" campaign. Anna Maria Chavez, the organizations executive, said "It's a better vehicle to tell the story that we are the best leadership program for girls in the world."